The following is the report of a 1794 Korean inspection of Ulleungdo and my analysis of it. The report is significant because it refers to an island named Gajido (可支島), which Koreans claim was a reference to present-day “Dokdo” (Liancourt Rocks). However, there is little or no basis for such a claim since the report mentioned no coordinates for Gajido (可支島), no bearing, distance, or description. Also, there are no other references to the island in Korean historical documents. In fact, there is no solid evidence in any Korean document or on any Korean map before 1905 that would support the claim that Koreans even knew about “Dokdo” (Liancourt Rocks). So why do Koreans claim that Gajido was a reference to “Dokdo”? Well, they base their claim solely on the fact that sea lions lived on both Gajido (可支島) and on “Dokdo” (Liancourt Rocks). In fact, the name, Gajido (可支島), means “Seal Island.” The problem with that logic, however, is that it ignores the fact that sea lions or seals also lived on Ulleungdo. In my analysis of the 1794 report, I will try to show that Gajido was not a reference to “Dokdo,” but was simply a reference to a place, rock, or island on or around Ulleungdo. In fact, an 1886 inspection of Ulleungdo, which you can read about here, said that sea lions or seals were hunted on Ulleungdo. That report, in itself, pours cold water on Korea’s “Gajido-was-Dokdo” claim, but the 1894 report below will pour even more. An 1882 map of Ulleungdo shows a cave on the west coast of the island named “Seal Cave” (可支窟), You can see the 1882 map here. Moveover, on modern maps of Ulleungdo, there is a cave on the west coast of Ulleungdo located at about the same location as the cave shown on the 1882 map. The cave on modern maps, however, is called Gajaet-gul (가잿굴), which appears to mean “Crawfish Cave.” You can see it on this modern map of Ulleungdo. I think Gajaet-gul (가잿굴) was originally Gaje-gul, which would mean “Seal Cave.” The “t” sound in the word “gajaet-gul” is added to connect the word “gajae” (crawfish) to the word “gul” (cave). Gaji-eo (可支魚) was the Chinese-character-based word for “sea lions” or “seals” in old Korean documents, but the pure Korean word for sea lions that is used today is “gangchi” (강치). In the Ulleungdo dialect, however, “gangchi” (강치) is pronounced as “gaje” (가제), which is very similar in sound to gajae (가재), which means “crawfish.” I think the cave labeled as gajaet-gul (가잿굴) on modern maps of Ulleungdo was originally pronounced as gaje-gul (가제굴). I base my claim on the fact that marine product lists from Ulleungdo never listed “crawfish” (가재) but did list “sea lions” (可支魚). You can see sea lions listed as a product of Ulleungdo on this 1750s Korean map of the island. Also, crawfish are freshwater animals, not saltwater. Anyway, I think Gajae Rock (가재바위) could have been what the 1794 Korean report referred to as “Gajido” (可支島). I base my claim not only on the fact that the name of the rock sounds almost exactly like the Ulleungdo pronunciation for “sea lion,” but also on the fact that this 1863 British map of Ulleungdo labels that southern tip of the island as “Seal Pt.” (Seal Point). “울릉도의 수토(搜討)를 2년에 한 번씩 변장(邊將)으로 하여금 돌아가며 거행하기로 이미 정식(定式)을 삼고 있기 때문에, 수토관 월송 만호(越松萬戶) 한창국(韓昌國)에게 관문을 띄워 분부하였습니다. 월송 만호의 첩정(牒呈)에 ‘4월 21일 다행히도 순풍을 얻어서 식량과 반찬거리를 4척의 배에 나누어 싣고 왜학(倭學) 이복상(李福祥) 및 상하 원역(員役)과 격군(格軍) 80명을 거느리고 같은 날 미시(未時)쯤에 출선하여 바다 한가운데에 이르렀는데, 유시(酉時)에 갑자기 북풍이 일며 안개가 사방에 자욱하게 끼고, 우뢰와 함께 장대비가 쏟아졌습니다. 일시에 출발한 4척의 배가 뿔뿔이 흩어져서 어디로 가고 있는지 알 수 없었는데, 만호가 정신을 차려 군복을 입고 바다에 기원한 다음 많은 식량을 물에 뿌려 해신(海神)을 먹인 뒤에 격군들을 시켜 횃불을 들어 호응케 했더니, 두 척의 배는 횃불을 들어서 대답하고 한 척의 배는 불빛이 전혀 보이지 않았습니다. 22일 인시(寅時)에 거센 파도가 점차 가라앉으면서 바다 멀리서 두 척의 배 돛이 남쪽에 오고 있는 것만을 바라보고 있던 참에 격군들이 동쪽을 가리키며 ‘저기 안개 속으로 은은히 구름처럼 보이는 것이 아마 섬 안의 높은 산봉우리일 것이다.’ 하기에, 만호가 자세히 바라보니 과연 그것은 섬의 형태였습니다. 직접 북을 치며 격군을 격려하여 곧장 섬의 서쪽 황토구미진(黃土丘尾津)에 정박하여 산으로 올라가서 살펴보니, 계곡에서 중봉(中峰)까지의 30여 리에는 산세가 중첩되면서 계곡의 물이 내를 이루고 있었는데, 그 안에는 논 60여 섬지기의 땅이 있고, 골짜기는 아주 좁고 폭포가 있었습니다. 그 왼편은 황토구미굴(黃土丘尾窟)이 있고 오른편은 병풍석(屛風石)이 있으며 또 그 위에는 향목정(香木亭)이 있는데, 예전에 한 해 걸러씩 향나무를 베어 갔던 까닭에 향나무가 점차 듬성듬성해지고 있습니다. 24일에 통구미진(桶丘尾津)에 도착하니 계곡의 모양새가 마치 나무통과 같고 그 앞에 바위가 하나 있는데, 바닷속에 있는 그 바위는 섬과의 거리가 50보(步)쯤 되고 높이가 수십 길이나 되며, 주위는 사면이 모두 절벽이었습니다. 계곡 어귀에는 암석이 층층이 쌓여 있는데, 근근이 기어올라가 보니 산은 높고 골은 깊은데다 수목은 하늘에 맞닿아 있고 잡초는 무성하여 길을 헤치고 나갈 수가 없었습니다. 25일에 장작지포(長作地浦)의 계곡 어귀에 도착해보니 과연 대밭이 있는데, 대나무가 듬성듬성할 뿐만 아니라 거의가 작달막하였습니다. 그중에서 조금 큰 것들만 베어낸 뒤에, 이어 동남쪽 저전동(楮田洞)으로 가보니 골짜기 어귀에서 중봉에 이르기까지 수십 리 사이에 세 곳의 널찍한 터전이 있어 수십 섬지기의 땅이었습니다. 또 그 앞에 세 개의 섬이 있는데, 북쪽의 것은 방패도(防牌島), 가운데의 것은 죽도(竹島), 동쪽의 것은 옹도(瓮島)이며, 세 섬 사이의 거리는 1백여 보(步)에 불과하고 섬의 둘레는 각각 수십 파(把)씩 되는데, 험한 바위들이 하도 쭈뼛쭈뼛하여 올라가 보기가 어려웠습니다. 거기서 자고 26일에 가지도(可支島)로 가니, 네댓 마리의 가지어(可支魚)가 놀라서 뛰쳐나오는데, 모양은 수소와 같았고, 포수들이 일제히 포를 쏘아 두 마리를 잡았습니다. 그리고 구미진(丘尾津)의 산세가 가장 기이한데, 계곡으로 십여 리를 들어가니 옛날 인가의 터전이 여태까지 완연히 남아 있고, 좌우의 산곡이 매우 깊숙하여 올라가기는 어려웠습니다. 이어 죽암(竹巖)•후포암(帿布巖)•공암(孔巖)•추산(錐山) 등의 여러 곳을 둘려보고 나서 통구미(桶丘尾)로 가서 산과 바다에 고사를 지낸 다음, 바람이 가라앉기를 기다려 머무르고 있었습니다. 대저 섬의 둘레를 총괄하여 논한다면 남북이 70, 80리 남짓에 동서가 50, 60리 남짓하고 사면이 모두 층암 절벽이며, 사방의 산곡에 이따금씩 옛날 사람이 살던 집터가 있고 전지로 개간할 만한 곳은 도합 수백 섬지기쯤 되었으며, 수목으로는 향나무•잣나무•황벽나무•노송나무•뽕나무•개암나무, 잡초로는 미나리•아욱•쑥•모시풀•닥나무가 주종을 이루고, 그 밖에도 이상한 나무들과 풀은 이름을 몰라서 다 기록하기 어려웠습니다. 우충(羽虫)으로는 기러기•매•갈매기•백로가 있고, 모충(毛虫)으로는 고양이•쥐가 있으며, 해산물로는 미역과 전복뿐이었습니다. 30일에 배를 타고 출발하여 새달 8일에 본진으로 돌아왔습니다. 섬 안의 산물인 가지어 가죽 2벌, 황죽(篁竹) 3개, 자단향(紫檀香) 2토막, 석간주(石間朱) 5되, 도형(圖形) 1벌을 감봉(監封)하여 올립니다.’ 하였으므로, 함께 비변사로 올려보냅니다. Gangwondo Governor Sim jin-hyeon reported to the king. I sent a order to Wolsong Commander Inspector Han Chang-sik to inspect Ulleungdo. These inspections are officially held every year and are rotated between the two frontier commanders. “We slept there and on the 26th, we changed direction (reversed course) and went to Gajido (可支島), where we surprised four or five sea lions that dashed out. They looked like water cows. Our riflemen all fired at once and got two of them. The geographical features of the beach landing (丘尾津) was the strangest thing. We went about ten ri into the valley, where we found the remains of what were clearly ancient dwellings. On both sides, the hills and ravines were so deep that they were difficult to climb up. Four ships carrying more than eighty men left for Ulleungdo at between 1 and 3 p.m. on April 21st. They ran into fog, rain, and heavy seas, and one ship appears to have been lost. The remaining ships arrived at Hwangto-gumi Landing (黃土丘尾津) sometime on the 22nd, which is a pretty fast crossing. Hwangtogumi was a beach on the northwest corner of Ulleungdo at or near present-day Taeha Harbor. You can see Hwangto-gumi (大黃土邱尾) on the following 1882 map of the northwest corner of Ulleungdo. The report said that it was about thirty ri from the valley entrance to the central peak of the island. It also reported that the inspection party saw a cave, a waterfall, and a rock. The rock was called Byeongpung Rock (屛風石). It also said that Hyangmok Pavilion (香木亭) was up above the area. The waterfall, the cave, and the pavillion were also mentioned in this 1786 survey report of Ulleungdo. The report described the valley at Tong-gumi as being “wooden-barrel” shaped and as having piled mounds of stone at the entrance. Those mounds of stone may have been graves. It also said that there was a large rock fifty paces offshore. Tong-gumi is still listed on Korean maps today, and the rock that was mentioned in the 1794 report was almost certainly present-day Geobuk Bawui (거북바위), which means “Turtle Rock.” You can see a picture of Turtle Rock here. On the 25th, the inspection party sailed around the southern-most point of the island to Port Jangjakji (長斫之浦), which can also be seen on the 1882 map shown above. Port Jangjakji was probably located near or at present-day Sadong Harbor (사동항). From Port Jangjakji, the report said the inspection party headed to “Southeast Jeojeon-dong” (仍向東南楮田洞), which suggests that there was more than one Jeojeon-dong. Actually, the following 1750s map shows a Jeojeon-dong (苧田洞) on the northeast corner of Ulleungdo, though the character for “Jeo” is different. The “Jeojeon” (苧田) in Jeojeon-dong (苧田洞) just means “ramie field,” so it is possible that there were more such fields on the island. In fact, on present-day maps of Ulleungdo, there is a port on the southeast corner of Ulleungdo called Jeodong Harbor (苧洞港), which is probably where “Southeast Jeojeon-dong” (東南楮田洞) was located. Afterall, it would only require dropping the “field” (田) character to make the new name. From Southeast Jeojeon-dong, the report said it was tens of ri from the valley entrance to the central peak. The report also said that three islands could be seen from Southeast Jeojeon-dong. The northern island was Bangpaedo (防牌島), which I believe was present-day Gwaneumdo. The middle island was Jukdo (竹島), which was most likely present-day Jukdo. And the island just to the east of Southeast Jeojeon-dong was Ongdo(瓮島), which means “Pot Island.” In pure Korean, Ongdo would be pronounced as Dokseom (독섬), and in mixed Sino-Korean and pure Korea, it would be “Dokdo” (독도). If Southeast Jeojeon-dong were present-day Jeodong Harbor, that would mean that Ongdo (Dokdo) was either present-day Chotdae-am (촛대암), which is right in front of Jeodong Harbor, or present-day Bukjeo Bawui (북저바위), which is farther out in the water. Here is a picture that shows Gwaneumdo (觀音島), Jukdo (竹島), and Bukjeo Bawui (북저바위) all together. The problem with the description of the three islands, however, is that the report said that they were only about 100 paces apart from each other, which is not the case. The report said that on the 26th, the inspection party changed directions, which can mean they reversed course, and headed to Gajido (轉向可支島). This suggests that Gajido (可支島) was somewhere back in the direction that had come, which means they headed back southwest. I think they were heading back to either the southern tip of Ulleungdo or to Seal Cave on the west side of the island. They may have missed the opportunity to kill some sea lions on their first trip around the point and went back hoping to surprise any sea lions that had come back up out of the water. Interestingly, the Korean translation does not say the inspection party changed or reversed course, but just said “they went to Gajido” [가지도(可支島)로 가니…] I wonder why? We slept there (Southeast Jeojeondong), and on the 26th, we changed direction (reversed course) and went to Gajido (可支島), where we surprised four or five sea lions that dashed out. They looked like water buffalo. Our riflemen all fired at once and got two of them. The geographical features of the beach landing (丘尾津) was the strangest thing. We went about ten ri into the valley, where we found the remains of what were clearly ancient dwellings. On both sides, the hills and ravines were so high and deep that they were difficult to climb up. It seems obvious from the above description that Gajido (可支島) was not a reference to “Dokdo” (Liancourt Rocks). It is simply ridiculous for the Korean government to claim that Gajido (可支島) was an old name for “Dokdo” based only on the mention of “sea lions,” given the fact that sea lions were also found on Ulleungdo. 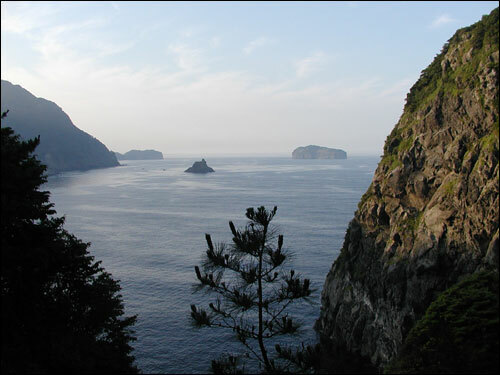 After Gajido (可支島), the report summaries the rest of their inspection by saying they visited the rocks off the north shore of Ulleungdo and then went back to Tong-gumi (桶丘尾) on the southwest side of the island to wait for calm weather to sail back to the Korean mainland. They finally set sail on April 30th and arrived back at their home base on May 8th, which means it took them more than a week to get back. The report said that Ulleungdo was seventy to eighty ri from north to south and fifty to sixty ri from east to west, but I am not sure how they got those measurements since the report only mentioned their taking two measurements. Also, though the 1786 report mentioned sea lions as part of the products found on Ulleungdo, sea lions were not included on the initial list of products in the 1794 report. The report, however, did mention that sea lion skins were part of the products brought back from Ulleungdo. Even if people do not agree completely with my interpretation of the above report, there is nothing in the report, except the mention of sea lions, that suggests that Gajido (可支島) was a reference to “Dokdo” (Liancourt Rocks). But sea lions were also found on Ulleungdo, so it is ridiculous to make such a claim. Moreover, there was other evidence in the report that tells us that Gajido could not have been “Dokdo,” including mention of a valley near Gajido that was at least four kilometers in length, which is longing than the whole island of Ulleungdo. Thank you for your great job again, Gerry! As I wrote about Gajido in another posting before, Gajido should be near to Ulleungdo, perhaps one of the small islands around Ulleungdo. From my past posting: “The authors went to 可支島 on 26th day and on the same day they came back to Ulleungdo as the names of the places in Ulleungdo, such as 竹巖、帷布巖、孔巖、錐山, can be read in the same sentence. Actually, the report did not give a daily account of what the survey party did on April 27, 28, and 29, but it did just give a summary that included a trip to survey the rocks on or off the northern shore of Ulleungdo. It then said that the party went to Tong-gumi to wait for good sailing weather. It does not say how long they waited for fair weather, but it did said they set sail for home on April 30. I think the best evidence in the report for refuting Korea’s claim that Gajido was a reference to “Dokdo” was the description of the valley near where they killed the sea lions. The report said they walked four kilometers into the valley, which means that there is no way the valley was on “Dokdo” since Dokdo is much less than four kilometers long. Korea’s “Gajido-was-Dokdo” claim is typical of the other Korean claims that their old documents talked about “Dokdo” (Liancourt) before 1905. In other words, such claims are based on weak associations and on silly or labored reasoning. All of it is just thrown up to try to hide the facts that Korea documents and maps did not mention “Dokdo” (Liancourt Rocks) and that Korea is illegally occupying Japanese territory. Your theory sounds more persuasive than mine. And the sentence below also does not fit to Takeshima/Dokdo. It says that there were ruined houses but nobody should have found traces of houses in Takeshima/Dokdo, because nobody couldn’t live there on the rock formation without soils and water. I think the best evidence in the report for refuting Korea’s claim that Gajido was a reference to “Dokdo” was the description of the valley near where they killed the sea lions. Does a Korean think that a Japanese sea lion inhabited only Takeshima? in the Pacific side, Kyushu Miyazaki-shi size Yodo river mouth northward, Hokkaido, Chishima, the Kamchatka southernmost extreme. so it is ridiculous to make such a claim. It is ridiculous but they are seriousーーーーーthat is a cause of tragedy. By the way, could you give me Toron Taker’s link to this 1909 Japanese map of Ulleungdo, again? I have misplaced it, again. I think that is a very interesting map and I would like to study the placenames on other parts of the island. Also, can anyone tell me the name of the island off the northern coast of Ulleungdo on this 1905 Japanese map? I cannot find that Chinese character. I am sure Korean historians know that there were sea lions on Ulleungdo, but I think they would whether keep other people ignorant of that fact. I think that Korean nationalism is so bad that Korean historians may feel it is patriotic to hide the truth. It’s 俵島 (tawara-jima) meaning a “straw rice bag” island. However, I do not think it is read in the Japanese way, since all other names apparently have Korean-stye pronunciations printed to their right in katakana. Yes, 俵島 would be “Pyodo” (표도) in Korean pronunciation, but the character on the map was written differently, so I wondered if it might be another character. Anyway, thanks. By the way, Ponta, I found the link to the 1909 map that I was looking for, so do not bother yourself with it. Is this the link you wanted? >I think that Korean nationalism is so bad that Korean historians may feel it is patriotic to hide the truth. Perhaps, it is also to keep their job and prevent being ostracized. Many Japanese historians have opendly talked about Korean scholars being perfectly frank and rational while in Japan, but the moment they go back to Korea, they start making the weirdest claims. In a way, the Korean society is proof that you don’t need the thought police to control speech; pressure from the public can work just as effectively. I put three “?” which I thought they might be mistakes. So if you have time, please check them. comment number 24 by: Cheap airline tickets.